John T. Edge, Anne Mendelson, Betty Fussell, Molly O’Neill, and David Leite talk about NY Times writer Craig Claiborne and the future of food journalism. This cigar-shaped sweet, swaddled in pastry and filled with eggy custard, was first made in…convents? Monica Bhide, author of Modern Spice: Inspired Indian Flavors for the Contemporary Kitchen, offers up perfect accompaniments to the Oscars. 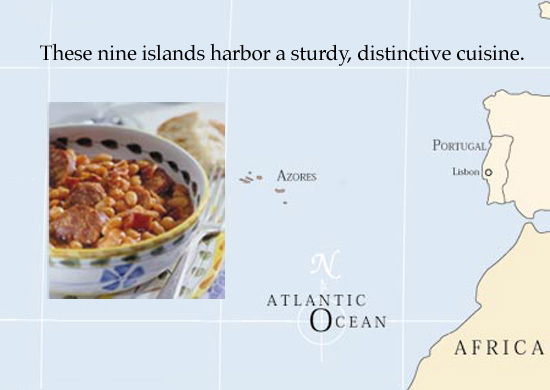 The Azores, the nine-island archipelago 1,000 miles off the coast of Europe, has simple, rugged Portuguese food and recipes all its own.